Most managers and business owners face a dilemma when they’re thinking about employee time tracking. From a business perspective, it makes perfect sense. It tracks employee productivity and project performance. It helps you decide where to allocate resources. And it provides insight into areas that may need improvement and development of employee skills. From an employee relations perspective, though, it’s not so clear. Employees may feel intimidated by demands to track their time. Or they could feel that they’re constantly being watched and evaluated. And for overly ambitious managers, employee time tracking may open the doors to excessive micromanaging. Want to get employee buy-in for time tracking? Here’s how you can. With that said, when the line is drawn, is employee time tracking effective? And does it help everyone? Or just management? In 2015, the services sector of the U.S. economy was losing about 50 million hours, or about $7.4 billion a day, in productivity. But companies can, on average, recover $52,000 in billable time per professional. How? By moving from a weekly or monthly timesheet to tracking time daily. Research shows that people who keep track of their time more frequently are better at it. They track their work in more detail and further fine-tune their sense of productivity. This fine-tuning helps them stop spending too much time on distractions. It also helps them identify and stop multitasking. Studies show that multitasking can drain up to 40% of our productivity, so keeping this habit in check can be a big help. Time tracking also sheds light on activities that take up too much time. This lets you analyze whether those activities are truly necessary. If they are, you can figure out how to optimize your processes. Continual analysis helps employees and managers further refine their productive processes. Increased accountability also leads people to a feeling of greater responsibility in their work. Involvement in complex projects requires that all parties work together in a consistent and structured way. By tracking the time spent on tasks, employees become more aware of their own contribution and its role in the project. This provides them with insight on how they can improve their work. Greater awareness brings with it greater accountability and the intention to shift into a more productive state. In addition to allowing employees to show what they have spent their time on, effective time tracking also allows managers to praise and recognize employees that are doing a good job. This helps employee morale and contributes to a more productive company. Effective employee time tracking gives managers a clearer understanding of the work process. If certain tasks consistently take up too much time, they may need to be reviewed and optimized. Transparency provides the necessary data to improve operations on an almost daily basis instead of creating sudden and dramatic disruptions. The transparency provided by tracking software also helps managers and supervisors get a grasp on work cycles and trends. This helps them plan projects more accurately and set aside resources and manpower more efficiently. Transparency can help you grow your business. Read our post on transparency and startup growth to find out how. Another positive outcome of such transparency is the reduction of distrust across teams. Without information regarding others’ productivity or time management, employees can make flawed assumptions about the rest of the team. This is particularly true for distributed teams. A recent survey found that 62% of remote workers fear they aren’t perceived as hard-working due to their absence from the office. Good time tracking systems provide objective data about the performance of employees. This helps supervisors get a clear picture of their employees’ productivity and assess them accordingly. On the employee side, such systems relieve fears and create greater trust between them and supervisors. Filling out manual time sheets is expensive. Filling out, combining, and analyzing traditional time sheets requires a lot of time, both from employees and admin staff who need to reconcile errors in time sheets and constantly remind employees to fill them out. Introducing a time tracking system streamlines this process. This is particularly important and useful for companies that work with contractors, such as freelancers or non-salaried workers. Such employees usually prefer to have a clear grasp of how they are doing in terms of workload and time spent on tasks. A time tracking system can further help them plan their time in advance in order to take up more projects or make up for the time when they will be away. Better timekeeping leads to the elimination of leaked hours. Companies lose hundreds of billable hours every year to poor time tracking on things like email and meetings. Because people forget about them. With time tracking, that’s not an issue. Employees spend more time on meaningful tasks, get more done, and keep better track of what they’re doing. All of that means a positive return on investment for your company. Of course you do. Hit the link and get started now. It’s measurable. Our customers have seen it. And it consistently helps all sorts of businesses be more productive and profitable. To get an idea of whether time tracking is right for you, we need to look at some of the drawbacks. With poor implementation, time tracking can be a major stressor. When time is given greater significance and value, people may end up being less patient and feeling pressured. Tracking employees’ time carries the risk of having them feel like they are being spied on. This is one of the most common fears that employees have when a time tracking system is implemented. No one likes to feel like they’re always being watched. Managers, supervisors, and executives need to clearly communicate the point of tracking time and tasks. It’s not to spy on employees. It’s to get a better idea of what employees are accomplishing, reduce micromanaging, and increase transparency. Managers should be clear about when and how they’ll implement tracking, what data they’ll see, and how they’ll use it. Of course, a degree of trust is built over time, once the system is up and running. But managers can do a great deal by managing expectations in advance. Employees often fear they will be micromanaged non-stop once they start tracking their time. And while certain managers may be tempted to do this, the point of tracking time is to spend less time on managing employees. These systems let managers supervise more efficiently without nitpicking or observing every detail of the work process. Time tracking allows managers to get a clear picture of an employee’s performance at a glance. And based on that, managers can dig into the details if they feel an employee is lagging behind, experiencing difficulties, or simply slacking. Such systems allow for greater precision of feedback, which should not be mistaken for micromanagement. Good feedback practices are especially important for remote teams. See our best tips on giving feedback to remote employees here. The cost of an employee time tracking system is a legitimate concern. Complex systems that allow automatic tracking and payroll or provide activity metrics and in-depth information can be expensive. But you don’t need to implement time tracking for the whole company right away. Scalable solutions allow you to start with just a few of your employees. When you begin seeing positive ROI on your investment within a few weeks’ time, you can consider adopting the system more widely. You can also opt for more affordable options; our own time tracking system starts at $5 per user per month. 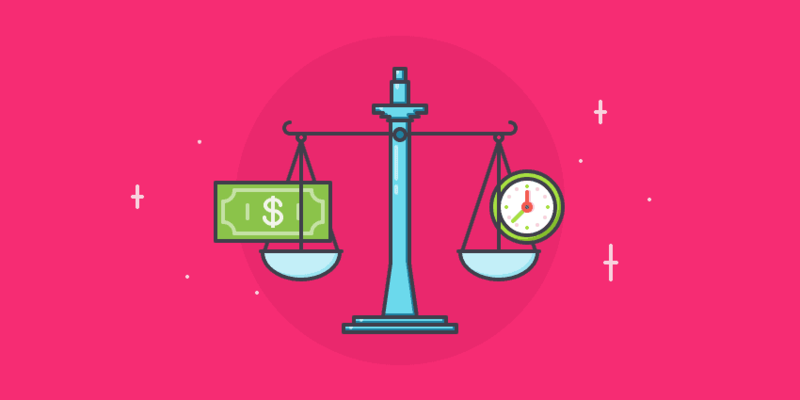 The irony of some time tracking efforts is that they end up costing both time and money. They may not be implemented properly, overlap with other systems, or require too much manual work from employees. The point of tracking employee time is to be more efficient and productive. If the introduction of a system decreases these measures, something is off. By choosing a system that has all these features built-in, and that can integrate with any other systems you use, you’ll save time and money. Not everything can be tracked and measured. Brainstorming is an example of something that’s hard to analyze in that way. Sometimes it takes hours of toiling to reach a breakthrough and resolve an issue in a matter of minutes. From a time tracking perspective, all of this may look like wasted time. That’s the worry, anyway. But time tracking doesn’t just aim to measure basic productivity metrics, like keys pushed or mouse clicks. What it provides is greater transparency about how efforts are distributed throughout the day. That lets managers see how effort is turning into results. And a good employee time tracking system allows employees to add notes to their activities to provide context. Screenshots might make it look like an employee wasn’t doing anything, but a note that they were brainstorming or researching clears up these issues quickly. With all of these pros and cons, it can be difficult to determine whether employee time tracking seems like a good decision for your company. But the research and our own growing record of case studies make it clear: it makes perfect business sense. One of our customers saved over $22,000 a year by tracking employee time. It helped another make huge productivity gains and close more deals. We use it ourselves, and if that’s not the best testimonial we can give, I don’t know what is. Across the board, time tracking has shown to reduce costs that arise from loss of productivity, lack of transparency, and inessential activities. Automated time tracking eliminates costs associated with traditional time tracking methods and excessive and cumbersome paperwork. And once time tracking is established and accepted within the company, changes in employee attitudes towards work also begin to happen. Has employee time tracking helped your company? How have you overcome the difficulties of using a time tracking system? Share your thoughts with us in the comments section!